Last Week in Review: The Jobs Report for December had some unexpected surprises. But was the news good or bad? Forecast for the Week: The economic calendar is packed with key reports on consumer spending, housing, manufacturing, and inflation. View: Want a fast track to knowledge and success? Check out the tips below. "Life is a mixed blessing, which we vainly try to un-mix." Author and journalist Mignon McLaughlin. The Jobs Report for December is in and the data was mixed. Read on as we un-mix the data and find out what it means for home loan rates. Just when it looked like the job market was improving, the Jobs Report showed that only 74,000 jobs were added in December. This was well below expectations and was the smallest increase since January 2011. However, the number of job creations for November was revised higher by 38,000, bringing November's total to 241,000.Adding to the confusion, the Unemployment Rate fell to 6.7 percent, which is the lowest level since October 2008. However, the Labor Force Participation Rate (LFPR) fell to 62.8 percent, matching the number from October 2013 as the lowest level since the late 1970s. The LFPR measures the proportion of working-age Americans who have a job or are looking for one, and it should be moving higher in a recovery. In addition, 347,000 people left the workforce last month, though it is unclear whether these are people retiring, people leaving the labor force because they can't find a job, or a mixture of both.What does this mean for home loan rates? Overall, the December Jobs Report was weak, which gives the Fed cover to continue its Bond purchases. Remember that the Fed had been purchasing $85 billion in Bonds and Treasuries each month to stimulate the economy and housing market. Due to strong economic data, the Fed decided at its December meeting to start tapering these purchases. Beginning this month, the Fed will now purchase $40 billion in Treasuries and $35 billion in Mortgage Bonds (the type of Bonds on which home loan rates are based). The decision to further taper these purchases will be dependent on economic data. If more economic reports are weak like the December Jobs Report, further tapering could be delayed and this timing could have a big impact on Mortgage Bonds and home loan rates this year. Economic reports kick off on Tuesday and the calendar is busy the rest of the week. Tuesday brings the Retail Sales Report for December. Look for a double dose of manufacturing data with the Empire State Index on Wednesday and the Philadelphia Fed Index on Thursday. Inflation data from the Producer Price Index will be released on Wednesday, followed by the Consumer Price Index on Thursday. Weekly Initial Jobless Claims will be reported on Thursday, as usual. Over in housing, look for the National Association of Home Builders Housing Market Index on Thursday. Housing Starts and Building Permits for December will be released on Friday. Friday will also feature the Consumer Sentiment Index for January. When you see these Bond prices moving higher, it means home loan rates are improving - and when they are moving lower, home loan rates are getting worse. To go one step further - a red "candle" means that MBS worsened during the day, while a green "candle" means MBS improved during the day. Depending on how dramatic the changes were on any given day, this can cause rate changes throughout the day, as well as on the rate sheets we start with each morning. 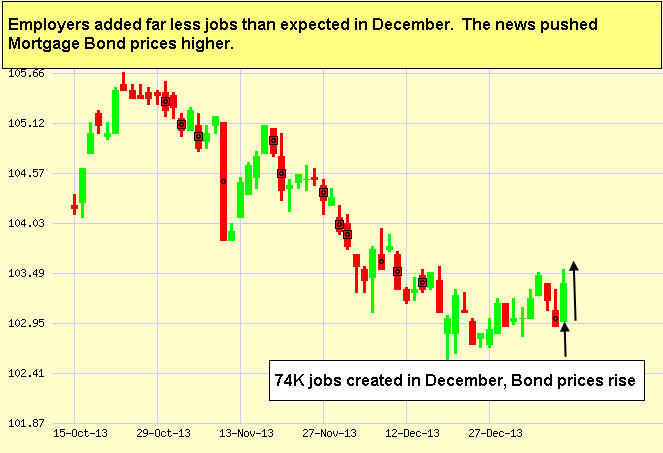 As you can see in the chart below, the weak Jobs Report helped Bonds improve. I'll be watching next week's reports closely to see if they show signs that our economy is improving. To Catch (and Keep) a MentorGetting a mentor isn't only a smart way to learn, it can be a fast track to knowledge and experience in just about any endeavor you can imagine. With a great mentor, doors otherwise locked to you can swing wide open and shorten your path to success by many years.If you're looking for a mentor, here are some things to remember:Deciding if you need a mentor is mainly a matter of knowing what you want to achieve most and the general direction you'd like to take. Stay open-minded if your mentor recommends another direction, but your objective should be the main goal. Consider carefully what you want the mentor to provide and how often you'd like to meet.Make a list of potential mentors, follow them on Twitter or other social media and notice any potential personality conflicts. Aim as high up the ladder as you can-even someone you think is out of reach, too rich, or too famous may have an opening for an assistant. Use LinkedIn and Google to find candidates.Write a letter of introduction and sign it by hand. Don't introduce yourself by email. If you want to make absolutely sure your message gets to your prospective mentor send it FedEx Overnight. If you get a YES then arrange to meet as soon as it's convenient. And if the first meeting goes well, arrange for next steps. Reacting unfavorably if you take a side-path the mentor has not taken. Choices you make that affect your mentor negatively in a material way, say financially, that could alter otherwise sound advice. Taking advice from someone with dissimilar tolerances for risk than you. Knowing more than your mentor about certain things-take it into account before accepting advice wholesale. Try to add value to your mentor making the relationship mutually beneficial. When you "arrive" don't forget to show appreciation to the people who helped you along the way.